“Die Rückkehr ins Goldene Zeitalter” is the debut album of the personal project of Alexander Paul Blake, who is also the mastermind of the German Gothic metal band Eden Weint Im Grab. Alexander decided to begin this project in 2012, driven by the urge to express his romantic ideas about black metal. He decided to give this project his full name, something quite unusual for black metal bands! Einheit Produktionen believed in him and released his debut in the end of April 2012. The album begins with an acoustic prolog, before the main songs. It is over 64 minutes long, containing 12 tracks totally (actually 8, since 4 of them are acoustic interludes). Their music is nature inspired cold black metal with a dark folklore mood. Guitars are solely responsible for the melodic lines, since keyboards are either totally absent, or very discreet! Alexander Paul Blake has a very balanced and natural sound and at the same time his production has something raw and “dirty”. Guitars have a pagan black metal touch, both in the more epic melodic parts and in the dark frozen rhythmic riffs. Maybe I am influenced by the artwork, but when I listen to this album images of night forest landscapes come into my mind… His songs are rather slow or mid-tempo, while there are some more atmospheric parts with ambient references and whispering vocals (something like Dornenreich) as well as a few faster extreme black metal parts. The overall feeling of “Die Rückkehr ins Goldene Zeitalter” is very melancholic, revealing the composer’s romantic nostalgia of pure archaic natural mysticism. Alexander’s expressive black metal screaming vocals are in the typical style of this genre, while all of his lyrics are in German. 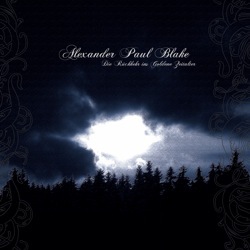 Alexander Paul Blake’s debut is a very solid album recommendable to all fans of dark romantic pagan black metal. He seems very talented musician, since he composed and performed all instruments and vocals. He is even responsible for the artwork and layout of the CD, which is released in 2 versions: one as standard jewel-case and one as digipak limited to 1000 copies, both with 16-page booklet. In the following links you can find more info and listen to his music.